Jaguar Land Rover (JLR) has come up with a pothole spotting car in an effort to prevent harm to vehicles and people. It’s currently estimated that wheel, tyre and accident damage caused by potholes costs the UK around £20m every year. Eventually, JLR hopes information collected by scanners on individual vehicles will transmit information to other cars and beyond. This could enable councils to fix damage to their highways as quickly as possible, saving money and possibly, lives. 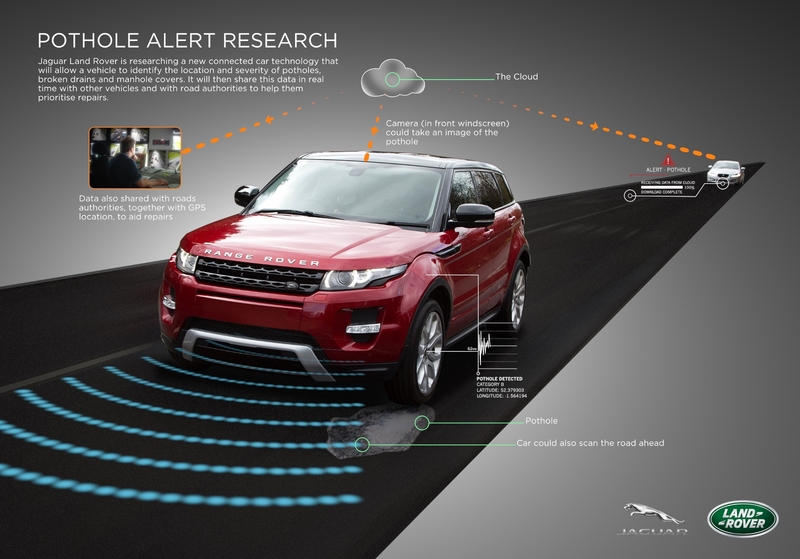 The company’s Range Rover Evoque and Land Rover Discovery Sport research vehicles use sophisticated sensors beneath the car. These can profile the road surface. They are also clever enough to identify the location and severity of potentially car-damaging obstructions such as holes, large cracks and raised or broken manhole covers. The computer monitoring the road also controls the suspension. The system, called MagneRide, continually adjusts this to compensate for damaged road surfaces. Pothole spotting car: What are the advantages? The big advantage is that by warning drivers about severe road damage early enough to take avoiding action, they can prevent damage to the vehicle. This is currently a big problem for drivers. Latest research by the Asphalt Industry Alliance which monitors the country’s roads shows drivers claim for damage to their vehicles caused by potholes every 11 minutes. Pothole spotting car: What about the future? Pothole spotting car: What else is Jaguar Land Rover planning? Currently Britain is faced with a plague of potholes. It’s estimated it will take councils in England and Wales more than £12bn to get the local road network back into a reasonable state. One in six roads is classed as being in poor condition.